Today after lunch I went to grab a little treat from our remaining Halloween stash. When it comes to Halloween candy, we work on the consecration system. All the kids’ candy is mixed and we all eat out of the entire stash. Selecting the right piece of candy can be a challenge. Do I want chocolate? Do I want something fruity? etc etc I usually go for one of each. When I went into the stash today, I saw one of my favorite candies of all time: Dots. I’m not sure why I’ve always loved them, but I do. It probably goes back to trips to the movies or this one time I was doing home teaching for my church and my older companion took me to the store and bought me this massive (at least that’s what I thought at the time) box of dots. I don’t want to be insensitive or ungrateful, but it was a disastrous result. If you’re a fan of dots, then you know what I mean. Yellow and green are the worst and this box was almost entirely full of yellow and green. Pink is the best, so at least the one that wasn’t yellow and green was pink. However, that hardly made up for all the yellow and green. As I pondered on this situation, I thought “Sometimes Life Works Out Like This.” I really have nothing to complain about. 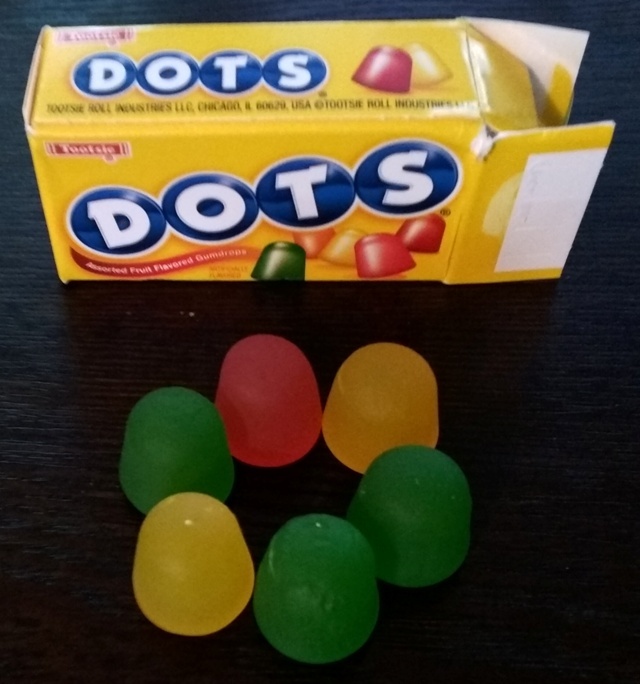 Yes, it was a sad thing to open a box of Dots to almost all green and yellow, but if that’s the worst part of my day, then I live a pretty amazing life. So, despite this extremely minor setback, I’m going to push through the day and hope that the next box I open in life will have a little better result. Plus, that Pink one was so delicious. Note: Yes, it’s December and we still have plenty of Halloween candy. I guess that’s what happens when you have 4 kids and trick or treat at your church, school, and then Halloween night. No, we didn’t all dress up as restaurant mascots as a ploy to get these restaurants to sponsor Crash Dad. Although, we definitely eat at all of these places, but probably eat at Jason’s Deli the most. P.S. I love that my kids are all barefoot and that my daughter snuck her doll into the picture. I’ve been meaning to write this Halloween post for a few days now, but life has been busy. What can I say? I never told you that this blog would be timely. In fact, my main goal is for this blog to be interesting. I plan to ask my wife and my mother if they think the blog’s interesting. If they give me the thumbs up, then I’ll keep doing it. Anyone else who’s entertained by my musings and perspectives is a huge bonus. Although, let me be clear. I love getting a good bonus! Halloween has come and gone and I think I can definitely say that this was the best Halloween yet. 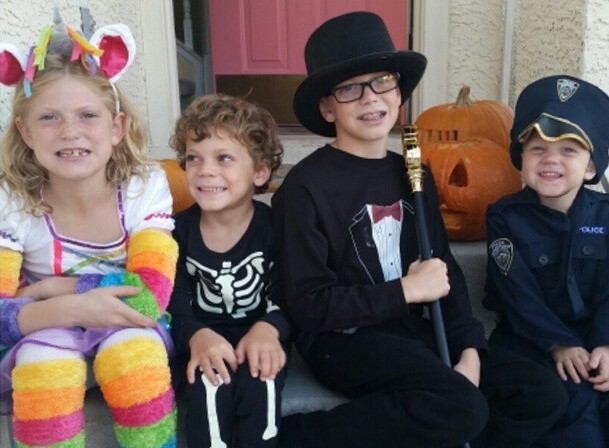 Ok, before I get into it, here’s the obligatory picture of the Crash Kids dressed up for Halloween. Can you guess what they dressed up as? Ok, the skeleton is easy and so is the little police man. Although, is there seriously anything cuter than a baby in a big hat? I dare say no. I love big hats on babies and for some reason he almost enjoyed wearing the hat. Something’s wrong with that kid. None of our other kids were good with hats as babies. They’d rip them off before we could even put them on. Now for the harder ones. My daughter’s isn’t really that hard. She’s a rainbow princess unicorn fairy ballerina. Well, that’s what I called her and I think she liked the description. She’s an overachiever like me. So, why would she want to be a Rainbow Dash My Little Pony when she could be a rainbow princess unicorn fairy ballerina. The oldest Crash Kid is a monopoly man. Pretty creative I thought. Although, I wonder what he’ll think when he gets older and realizes that the money cane he used for the costume most people would call a pimp stick. Oh well, he didn’t know the difference and he’s clearly not a pimp. He’d need gold braces for that costume. We collected far too much candy on this trip. In fact, after our 5th house the kids buckets were so full they had to come and unload them in the bags attached to the stroller. That’s just crazy! After ~5 houses they had more candy than I was going to allow them to eat. They were running so fast from door to door. Little did they know that it was all in vain since all this surplus candy was going to be given away. The orthodontist will get 10 pounds of candy in return for some virtual points (Don’t ask me what it really is, but we’ve collected a lot of points.). Then, the rest will go to the Bishop at church. Our kids can go and get a piece each week. If we give 10 lbs of candy to the orthodontist, you might be wondering how much candy will be left to give to the Bishop. Fear not! Crash Wife has a ritual of counting, documenting, sorting and otherwise organizing the candy the kids collect. Yes, we practice a shared candy system where all the kids candy is lumped into one. Makes for less complaining (especially when dad wants to eat all the Butterfingers). Long story short, my wife weighed the Halloween haul (yes, that’s the appropriate word) at 34 lbs of candy. That’s basically the weight of Crash Kid #3. Plus, it includes 116 full size candy bars. I agree. It’s totally and completely insane. 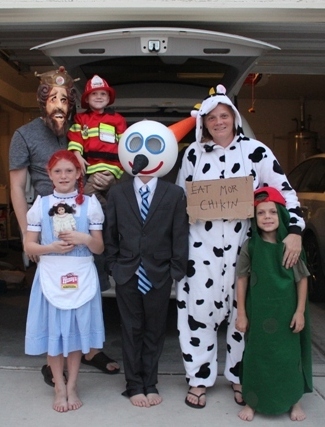 Our kids won’t have any idea what a normal Halloween is like. Now you see why our spoiled children get to learn about giving away most of their candy. You might remember that I mentioned moving the candy from the trick or treating buckets to bags attached to the stroller. That system worked quite well until the end. I ran into my friend (Yes, I really do call her “friend” every time I see her) and told her that we had to take a picture together. I think her friends probably wondered who this crazy old man was, but why be a crazy old man if you can’t act like one? While Crash Mom was taking our picture, I heard a crash of bags hitting the ground. Torn between finishing the picture and addressing the crash, the picture below is the final result. 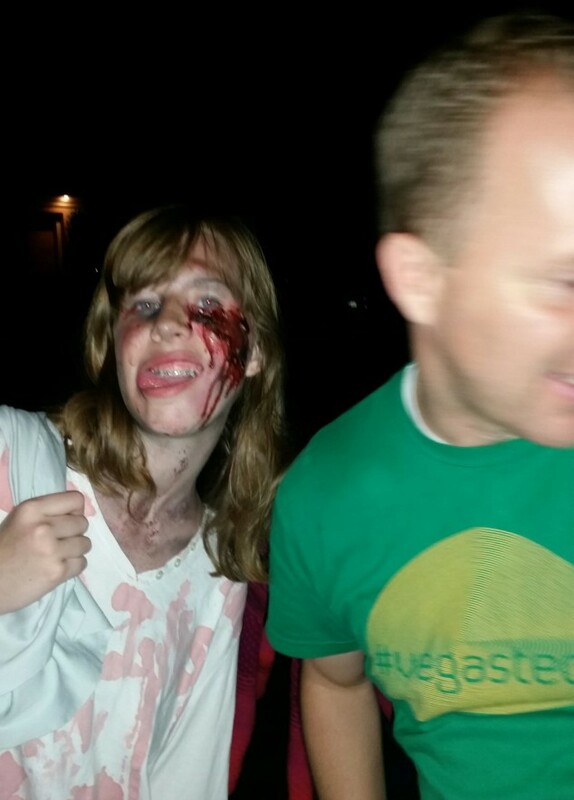 A great picture of my bloody friend and half of me as I go to see what crashed. Indeed, the stroller had toppled over. Crash Baby was up in the air and the bags of candy on the ground. Ahh…Physics at work. 34 lbs of candy is heavier than Crash Baby. I think Crash Baby kind of enjoyed the ride, but that’s when I knew it was time to go home. Can You Say Pumpkin Patch and Corn Maze? A couple of people told me that they were interested in my Daddy Blog since they had read many Mommy Blogs, but they were interested in how a dad’s perspective might be different. I think my wife is interested to read that as well. Hopefully this post starts us down that path, but Crash Dad might be a disappointment for them since I’m likely going to post as often (or more often) about my job, my random thoughts, my passions, and my children and family (not necessarily in that order). Maybe I’m wrong and I’ll just write about my children. I’m sure there will be plenty to write about. My kids are crazy. Crazy in a good way. They’re just like me. I’m not afraid to admit that I’m a little bit crazy. That’s what keeps life interesting. Although, here’s my real problem with writing about my kids. If I’m writing about my kids, I’m likely going to include some pictures. Let’s be honest, if I put pictures of my kids in a post, then it won’t really matter what I write about it. See what I mean? I’m pretty sure most of you didn’t even read those first two paragraphs. All you wanted to do was look at the picture of us at the corn maze. 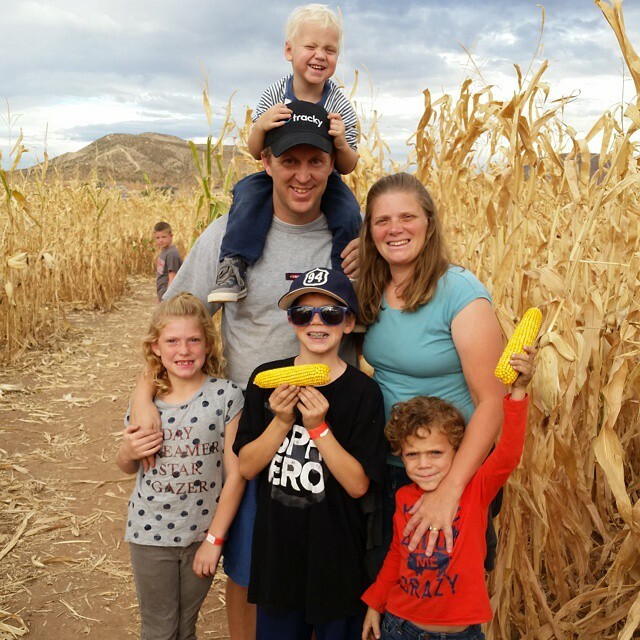 Can I just ask…why did my kids love corn in the corn maze? Seriously, I’ve never seen my kids want to shuck the corn on the cob at home. In the corn maze I couldn’t stop them from shucking the corn. In the picture above, we’re about 100 feet into the corn maze. That’s right. We’re 100 feet in and we already have 2 ears or corn ready for the picture. You should have seen us in the end. Alessia even created a stock pile of corn that she went back to get. 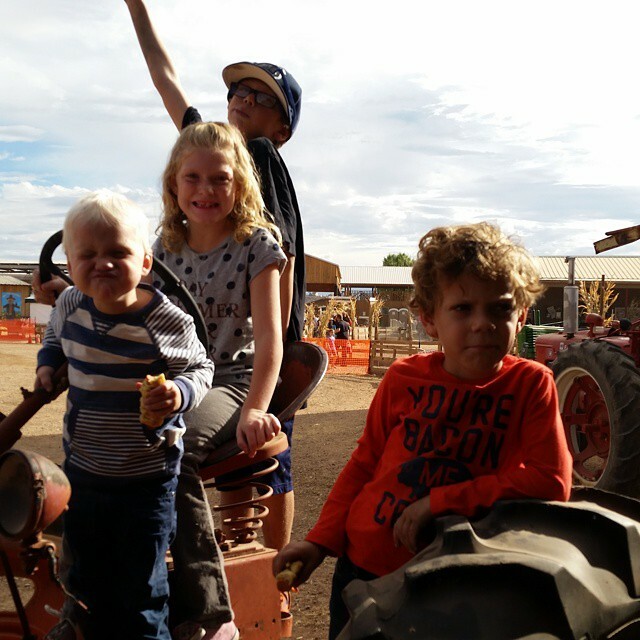 You can imagine their disappointment when I was a bad (or is it good) father and told them that we weren’t taking any corn out of the corn maze. Also, in case you missed it, I think the kid that photobombed us probably was jealous of our corn. I love the incidental photobomb. Ok. Let’s be honest. I love photobombs period! Now that you haven’t read this either, here’s a few more pictures to keep you coming back and reading this site. Is there anything cuter than oversized glasses and hats on babies? Ok, you’re right. Elmer Fudd faced baby might beat it. Seriously though, we asked Gianluca to smile for the camera and that’s the face he makes. I’m not sure what Curtis is doing with his arm in the air, but I wouldn’t be surprised if the next frame was him whacking his sister with it. Why do little boys like to whack their sister? I don’t get it. I always fought my brothers, but never my sisters. Indeed. Children, please keep at least a pumpkin between you and your brother/sister. That’s going to be the new saying in our house. I guess that’s one way to celebrate the season. 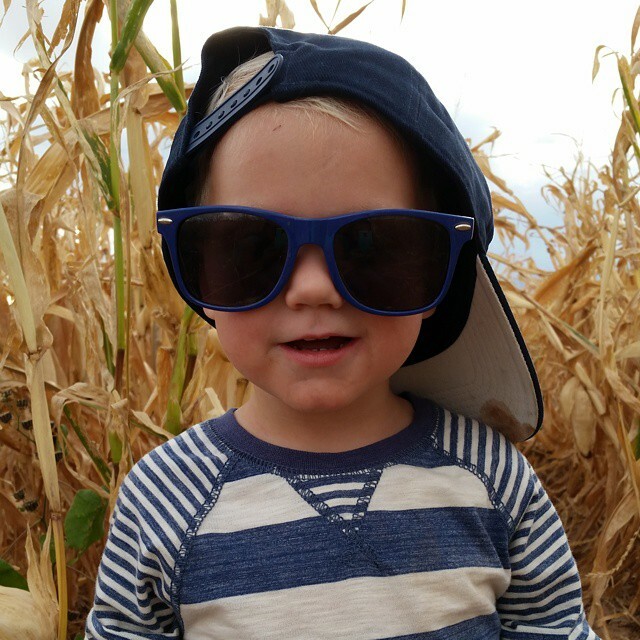 All in all, the trip to the pumpkin patch and corn maze was a success. 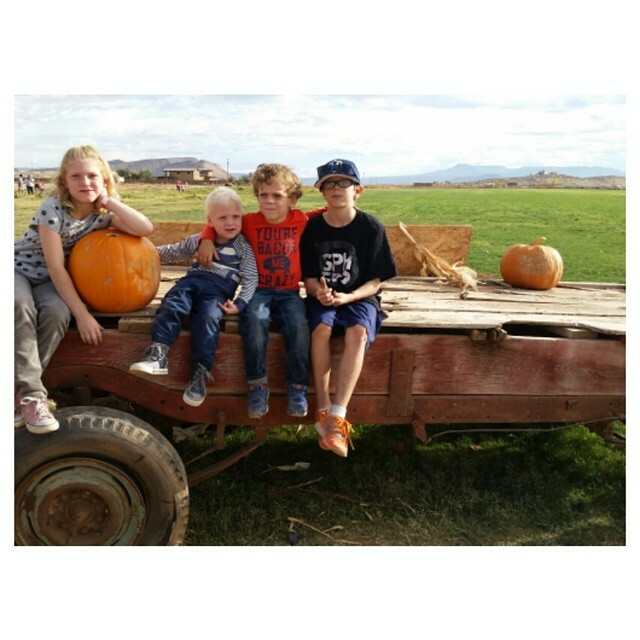 Although, I wouldn’t be surprised if the trip to Brick Oven for pizza and pasta won’t be just as memorable as the pumpkin patch and corn maze itself. I should have taken a picture, but Curtis drew a plan on the back of his kid’s menu of which pizza he wanted to eat from the pizza buffet (They call it the Heaps Sampler). It was too funny watching him cross off each thing as he ate it. I won’t bring up the fact that they didn’t even have any bread ready and were running out of pizza. What kind of a pizza place is that? Ok, how’s that? I’m I now officially a Daddy Blogger?